The Bears lost veteran center Will Montgomery to a serious-looking ankle injury in Week 4. 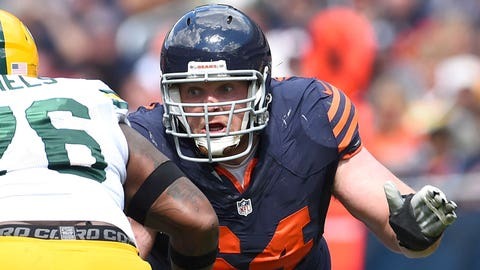 Chicago Bears took a hit along their offensive line on Sunday, when starting center Will Montgomery left the game with an ankle injury in the first quarter of the Oakland Raiders game. Montgomery had to be carted back to the Bears’ locker room, according to ESPN’s Jeff Dickerson. Center Will Montgomery just got carted back to the locker room. It did not take long for the Bears to announce that the veteran offensive lineman would not return to action against the Raiders. Matt Slausen bumped over from his usual guard position to fill in at center after Montgomery’s injury. Not long after stepping in, a botched exchange with quarterback Jay Cutler resulted in a fumble, which the Raiders recovered. It’s worth noting that the Bears selected center Hroniss Grasu out of Oregon in this year’s draft, but he was inactive for Week 4. This may only be a short-term solution for Chicago’s offensive line. If the Bears will be without Montgomery for an extended period of time, they might want to experiment with Grasu in the starting lineup.